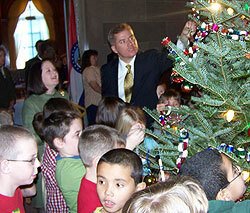 A holiday tradition continued today, with schoolchildren assisting Missouri’s Governor and First Lady to decorate the Christmas tree in front of the door to the Governor’s office in the Capitol. This year it was second-graders from Eugene Field Elementary in Mexico, singing carols, and decorating the tree with homemade ornaments. Governor Blunt says it’s a tradition he will miss, and Mrs. Blunt says she has appreciated the chance to get to know the people of Missouri firsthand.